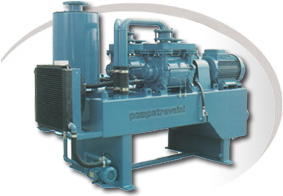 POMPETRAVAINI is one of the leading world-wide manufacturers of liquid ring vacuum pumps with single stage (TRV & TRS) en two stages (TRH) pump series. With the experience acquired through decades of engineering research, continual investments in the latest technological advanced machinery, and sound mechanical know-how, Travaini's product is today synonymous with high quality, high efficiency, robust construction and maximum reliability. 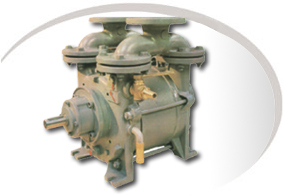 The groups of series HYDROSYS are composed of a liquid-ring vacuum pump standard TRH, TRS, TRM, TRV, of a cyclonic separor air/liquide, of a heat exchanger, the whole assembled on a compact support. 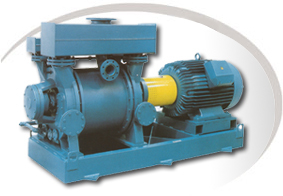 During its operation, the vacuum pump rejects gas aspired through disc of distribution as well as part of the liquid of ring present inside the pump and which must constantly be renewed. The air/liquide mixture passes in a cylindrical tank where separation is carried out: the gas leaves by the higher part of the tank whereas the liquid is stored partly low, ready to be sent again towards the vacuum pump. 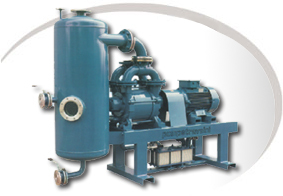 Systems OILSYS include/understand a liquid-ring vacuum pump of our series TRH, TRS, TRM, TRV, a separating tank also being used as support, a heat exchanger and an oil separator in order to eliminate any oil mist. A mineral oil or equivalent is used as liquid of service. 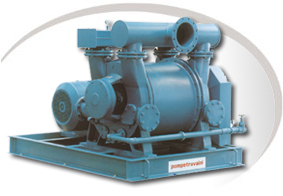 This fluid has physical properties making it possible the pump to reach performances maximum as regards vacuum for vacuums < to 100 mbar. These systems were used successfully in industries of manufacture of ceramics and clay, in the processes of the skin and wood, in packing and the clothes industry, pneumatic transport, the evisceration of the poultries, the extrusion of plastics and the pasta products, etc. Flow up to 30 000 m³/h, maximum vacuum 40 mbar.